Become a qualified bartender and have a great time doing it! Here at European Bartender School, we have been perfecting our unique approach and our finely-tuned practical training methods since 1999. The result is our acclaimed International Bartender Course. It's the world's most popular and comprehensive bartender course that can take you from zero to feeling at home in any bartending role. But we haven't stopped there. We are constantly adding a variety of specialized and progressive bartending and hospitality courses to enhance the skills of experienced individuals. At European Bartender School, you’ll achieve bartending excellence and have an amazing time whilst doing it. Our 50 000 + satisfied students can testify to it. Being a European Bartender School graduate automatically puts you head and shoulders above the competition. Bars, venues, and spirit brands across the globe acknowledge that our education is of the highest quality and that our graduates are accomplished bartenders. Graduating from our International Bartender Course or our Advanced Bartending Course will guarantee you free access to our exclusive job platform, EBS MatchStaff. Thanks to bar and hospitality industry leaders like Club Med and Be at One, we're connecting European Bartender School graduates with employers worldwide. You and your fellow students will go through a lot during your EBS course. You’ll learn together, work in teams, and socialize outside of school. You’ll discover extraordinary places and leave with friends and memories that’ll stay with you for life. Choose from our schools located in big cities, on exotic islands, or high up in the mountains! Enjoy the freedom of traveling the world and working in different countries. Meet people from all over the world whilst learning a valuable profession. We are the largest bartender school in the world in terms of the number of students we educate and the number of schools we have worldwide. This is why our certificate is globally-recognized and is something to be proud of. Our International Bartender Course is the industry’s most comprehensive course. It’s recognized due to the first-class practical and theoretical education our students receive. Designed to develop the knowledge and skills of experienced bartenders to an exceptional level. Strictly not for beginners. An in-depth and hands-on course designed to radically enhance the skills and knowledge of experienced bartenders. Learn about molecular mixology, cocktail presentation, spirits in extensive detail, cocktail families, and much more. 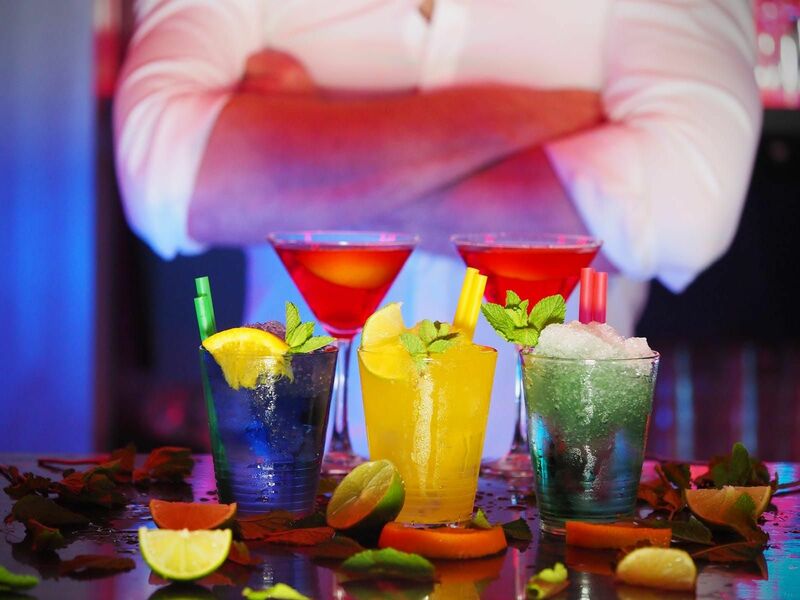 Access our worldwide job platform, EBS MatchStaff, as an Advanced Bartending graduate. Coffee creation from bean to cup. Gain the skills and knowledge needed to make the perfect coffee. Want to learn about the fascinating world of coffee, develop your barista skills or open your own coffee shop? Whatever your goal, our Barista Course has plenty to offer. Reach the level of a highly-skilled working barista in just 5 days. Learn brewing methods, latte art, coffee flair & lots more through hands-on training with expert instructors. No previous experience required, just a passion for coffee and a desire to learn! Fast-track your way into the competitive bartending industry without making any big time or financial commitments. Our highly-trained instructors will equip you with all the essential bartending skills in one fun-filled week. Start working at restaurants, bars, pubs and events serving basic cocktails as soon as you finish the course. Learn the basics of bartending and have a fun-filled week! Get the equivalent of two months experience working in a bar serving simple drinks in just one week. You’ll have no problem finding an entry-level position in a range of pubs, bars, and clubs as soon as you finish the course. Even if you are a novice, this course will make you capable of working in any bar worldwide. 4 weeks of instructor-led training will guarantee that you finish the course with a complete bartending skill set. Over 7000 students graduate from this course every year which makes it the world's most popular bartender course. Learn to make your own infusions, syrups, and craft cocktails using advanced techniques. Jump into the fascinating world of mixology and create your own products and modern twists on classic cocktails. Study the remarkable history of cocktails and bartending, from the pre-prohibition era to marvelous contemporary cocktails. This is our second most popular course as it fantastically complements our International Bartender Course.